The Chinese philosopher Mo Tzu (470-391) apparently wrote that "the sources of knowledge lie in what is written on bamboo and silk, what is engraved on metal and stone, and what is cut on vessels." I quote in accordance with Nicholas Basbanes, On paper. The "Everything" of its Two-Thousand Year History by a Self-Confessed Bibliophiliac (New York: Alfred A. Knopf, 2013), p. 5. I am not sure it was written by Mo Tzu or Mo Zi, as he is also called. The Book of Master Mo seems to have been compiled over a number years by his pupils. Still, it is an interesting reminder that before paper, there were other ways of fixing memory. Long before paper, people realised "Verba volent, scripta manent." I did like Basbane's book, though I do believe that his choice of topics is less than judicious. Furthermore, precise references—any references—are often lacking. Thus he does not tell us where his quote of Mo Tzu comes from. I had encountered the notion of a "shelf of honor" or "Ehrenbort" before in Thomas Mann, "Antwort auf eine Rundfrage." On Mann's shelf of honor: Schopenhauer's World as Will and Representation took a large place, but it also held Shakespeare, Goethe, Novalis, [and] Nietzsche." I find this idea interesting. Though I do not have a physical shelf dedicated to books most important to me, if I did (or when I do) it will probably contain Montaigne's Essys, Lawrence Sterne's Tristram Shandy, Immanuel Kant's Groundwork, Lichtenberg's Sudelbücher, and Kafka's Metamorphosis. I have known for a long time that the Rotring Esprit is a successor of the Rotring 400. The introduction of the Esprit must have coincided with (or have come shortly after) Rotring's decision to drop numbers in their names of pens and assign names. Another pen that was affected was the new "Newton," is a successor of the 600. One may argue that the first Newton was an improvement over the old 600 which had serious problems with the mechanism that holds the cap in place. After much use, the mechanism that makes the cap click in becomes worn, and the cap remains loose. Well, it appears that the new mechanism is not much better, as it also wears out and sometimes gets even ripped off the pen. The 400 and the Esprit have a similar relation. It appears that Rotring tried to fix the issue with the red ring (indicating its brand) at the bottom of the barrel. The red ring is now on the cap, the surfaces are matte rather than shiny (on most models, and the protrusion is gone. The Esprit truly is a "new and improved" version—something that is not necessarily true of the Newton as compared with the 600. I consider the Esprit to be one of the finest pens Rotring ever made. But, however that may be, both the 400 and the Esprit have the same nibs that they are great writers. Why the can you buy the Esprit for roughly $30.00 on eBay, while the 400 is advertised for almost five times as much? I believe the answer is supply and demand. There are still many Esprits around, but 400s are very rare. In fact, Rotring does not seem to have produced very many of these pens. Is that irrational? Probably not. If you are a collector you may prefer something rare and imperfect, just because it is rare (like a stamp or a bill with a mistake in it). But if you are just interested in using the pen, it would be foolish to pay more for less. There is, of course, also another reason. There are sellers on eBay who believe that the name "Rotring" automatically means big profits for them. They advertise Newtons (of both generations) as 600s, and want more than $300.00 for some of them. There is even someone who tries to sell a cheap plastic pen that is available on the German eBay site for around $10.00 for eight times as much. I wonder how many of those she/he sells. Is it irrational for someone to do this? Probably not, even if greed is not a virtue. More importantly, perhaps, I do believe that it is irrational for a buyer to pay outrageous prices. Another thing that is interesting to me is that both the 400 and the Esprit have definite similarities to the Lamy CP1. I do not know which pen was developed first, but I do see an influence or "cross-fertilization." The Lamy CP1 is perhaps more stylish than the Esprit, but I still like to write better with the Esprit. It's not quite as thin as the Lamy and better designed for my fingers. Should you wonder ... yes, I have an obsession with my writing instruments that is almost as intense as that of Roland Barthes, and this includes at least one piece of software. 1. I am not talking about the telescoping mini pens and pencils which were introduced later and became the "Parker Esprit." They are very different, and I don't like them. Nor am I talking about the telescoping mini pencils that have the same finish and that I like. 2. I paid a lot less for the 400 than what people want on the U.S. eBay site. Can You Still Buy Papyrus Paper? As almost everyone knows, papyrus is one of the first writing materials in the western world. The very word "paper" derives from it, and papyrus scrolls were displaced only after the codex took over in early Christianity. So, an idle question occurred to me: Can you still buy it? A search that brought up a stationary store, a kind of software, and other kind of irrelevancies, ultimately led me to this: Papyrus for School Projects. There are other versions available. Will I buy it and write on it? The answer is probably not. My curiosity does not go that far. This technology is not a live option. It should, however, give hope to those of us who still rely on paper. Paper will probably be good for the next 1000 years, if papyrus is anything to go on. I referred in the last post to Plato's Phaedrus. So let me offer a few musings on Plato's ideas on "alienated memory." The Phaedrus has always been regarded as an odd dialogue because it is difficult to place within the Platonic corpus and because it is not clear what it is about. Thus, A. E. Taylor, noting that the dialogue seems to lack unity, wondered whether it is about the principles on which a proper rhetoric or prose style may be founded and thus the question as to whether there could be a proper science discourse, or whether it was a consideration of the question of eros and the use and abuse of sexual passion in persuasion. While he decided that it is the former, he also found that the problem of the invention of writing also plays a subordinate role in this project. If the entire dialogue is seen as concerned with the philosophical use of language or logos in general and writing, in particular, composition with techne and without techne (277B 1), then the beginning and the end will indeed fit together like parts of a living organism. The discussion of writing in the final section of the dialogue is prepared from the beginning, by repeated references to books and writers (228A 2, 230D 8, 235B 8, D 6, E 5). Indeed the issue of writing is raised from the very first moment, by the emphasis of Lysias' book which Phaedrus is hiding under his cloak (228D)." This interpretation would also answer the question as to where the dialogue fits in systematically Plato's work. It is the last Socratic dialogue and represents Plato's taking stock of "his own work as a writer. This view is attractive, but I doubt that it is correct. To start with: it is misleading to say that "the issue of writing is raised from the very first moment, by the emphasis of Lysias' book which Phaedrus is hiding under his cloak (228D)." It is not the question of writing that is being raised, but the question about the use of a book. More specifically it is the question of a book that is carried under a cloak. In other words, Plato's question is primarily about the product of writing, and secondarily a question concerning the consumption of writing,or more precisely, about how a book should or should not be used. This raises the question of reading more than the question of writing. Furthermore, it should be obvious that when the first speech is "red off from this book" by Phaedrus, Plato is more concerned with with reading (to others) or the consumption of books than he is with their writing or production. The same thing is true about 228 A2. It is not about writing, but about "repeating by heart" what someone else took a long time to compose. One might go as far as to say that it is contrasting memorization and reading, or about how to store information. In particular, it raises the question whether knowledge is better stored in the mind or ona scroll. But one thing it is not about, is the contrast between writing and speaking. The same may be said about other passages: (i) 230 8 is about "volumes of speeches" and their being read, not about their being written. Indeed, it is the introduction of the speech "read from this book." (ii) 235B 8 is concerned with an evaluation of what has just been read as inadequate. Socrates claims that Lysias, the author of the speech, probably would also find it inadequate on reading or re-reading it. (iii) D 6 appeals to a comparison between book and a living speech and (iv) E 5 is also best read about the products of writing than about the writing process. The evidence given by Kahn does not support the view that the dialogue is about writing directly, but rather the view that it is about reading and the products of writing. The claim that "in reflecting on writing the dialogue reflects upon itself" is wrong, at least when we consider the dialogue up to the end of Socrates' first speech. The dialogue simply has not "reflected upon writing" and therefore also not on itself. Furthermore, I have no clue how the self-reflective nature of the dialogue would follow even if I were to agree that it is about the writing, and not the reading, of speeches. Presumably the writing of dialogues is very different from the writing of speeches. Kahn continues his investigation of "Plato's reflections on writing" by considering 276C 9, where Socrates shows that a written work, like a painting,"cannot teach, that is, impart knowledge" (377). I written book cannot be examined, it cannot adapt to the audience. "Together these two failure are what Plato has in mind when he denounces the naivté of an author or reader who thinks that there can be anything clear ... and secure or reliable ... in a written work in philosophy (275C 6 cf. 277D 8-9). Again, Kahn does not notice that this passage is not6 about writing per se, but about the effects of "a written work" (377). The passage is primarily neither about a reader nor about the writer? It is about the product of writing, even about a particular product of writing, namely a written speech. 277D 8-9 is indeed about the writer, but only insofar as the product of their writing (a political speech) may constitute a matter of reproach to them. But this has little to do with writing per se. Nor does it does not constitute anything that might be called "reflections on writing." At most, it is a reflection on a certain kind of writerly product (and what this product shows about its producer). So, if the Phaedrus is about something it is about the difference between readers and thinkers, about the difference between the products of writing and the products of true teaching. It is not about the process of writing or about writing as an occupation per se. Furthermore, the text does not say that writing is bad or suspect. It is primarily concerned with the thesis that writing will improve memory and that it is a recipe (pharmakos) for memory and wisdom. Plato argues that it isn't, that it cannot replace memory and that at best it can serve to remind of what we once must have learned and must already be "within ourselves." Like Fromm, Plato argues that external memory is "alienated memory." And, like Fromm, he is just wrong. There are others, like Jacques Derrida, who have "weighed in" on this question. I will spare you my views on them. Remembering can occur in either the having or the being mode. What matters most for the difference between the two forms of remembering is the kind of connection that is made. In the having mode of remembering, the connection is entirely mechanical, as when the connection between one word and the next becomes firmly established by the frequency with which it is made. Or the connections may be purely logical, such as the connection between opposites, or between converging concepts, or with time, space, size, color, or within a given system of thought. In the being mode, remembering is actively recalling words, ideas, sights, paintings, music; that is, connecting the single datum to be remembered and the many other data that it is connected with. The connections in the case of being are neither mechanical nor purely logical, but alive. One concept is connected with another by a productive act of thinking (or feeling) that is mobilized when one searches for the right word. have that information, and I do not try to engrave it on my brain. I am sure of my possession—except that when I have lost my notes, I have lost my memory of the information, too. My capacity to remember has left me, for my memory bank had become an externalized part of me, in the form of my notes. Fromm does not want to deny entirely that, "considering the multitude of data that people in our contemporary society need to remember, a certain amount of notemaking and information deposited in books is unavoidable," but he also thinks the "tendency away from remembering is growing beyond all sensible proportions. One can easily and best observe in oneself that writing down things diminishes one's power of remembering." Fromm is talking here about the phenomenon that I have referred to as "external memory" before, and I think he is missing the boat by a mile. External memory is not "alienated" memory," and in any case is nothing new or restricted to "contemporary society." The critique he offers is old as Plato's critique of reading or writing in the Phaedrus. External memory is not, in my book (and indeed in any book), deficient memory, but rather what some people would call an "affordance." The parallel would be between using a bicycle or a car and walking. Riding is not "alienated walking." To use wheels is not ontologically inferior to carrying things in your arms, or so I would argue. 1. I am grateful to Christian Mähler of the Notizbuchblog for calling my attention to this passage by Fromm (in German). I do not take myself to disagree with him in the specifics. Rather, I make a more general point. I try not to comment on the logical howlers I find every day while surfing the Internet especially in sites that give advice to "writers." But I cannot help myself today. Consider this: "If you’ve got a copy of Scrivener, then you know just how useful it is. I’ve had my copy for nearly a year and absolutely loved it." Well, it may well be that you "loved" or "love" a program, but it follows in no way at all that "If you’ve got a copy of any piece of software, then you know just how useful it is" just because you "absolutely loved it." And I don't have to say that "I've got" a copy of Scrivener but do not find it very useful—primarily because it does not do styles. There is no need to point this out because the presumption that others must share your preferences is just that: a presumption. Perhaps a well-placed "probably" would have helped. Here another application of the fallacious schema: "If you have looked at sites that give writing advice, then you know just how useful they are." I try to remember this ... (argh), I usuually ignore this. Hope springs eternal, as they say. I just downloaded a note-card program for Windows called Throughline by Storymind. So far, I have just played around with it, but I find it compelling at $9.95. It's not a complicated program. It allows you to create cards on a canvas, name them, move them around and arrange them in accordance with four different layouts: freestyle, single line, multiple lines, and timeline. Double-clicking on a card opens an edit window that allows you to create and change the contents of cards. 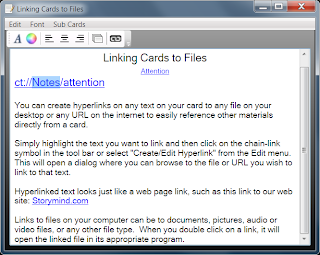 What makes the edit window really interesting is that "you can create hyperlinks on any text on your card to any file on your desktop or any URL on the internet to easily reference other materials directly from a card." Of special importance for me is the fact that it recognizes ConnectedText Urls, so that I can use it to interact with the information I have in ConnectedText. "To print the names and content of all the Cards in your deck, click on the printer symbol on the tool bar or select the "Print" option in the File menu." "To export your deck of Cards to an RTF file which can be opened by your word processor, click on the curved arrow symbol on the far right of the tool bar or select the "Export" option in the file menu." Those are the essentials as far as I am concerned. 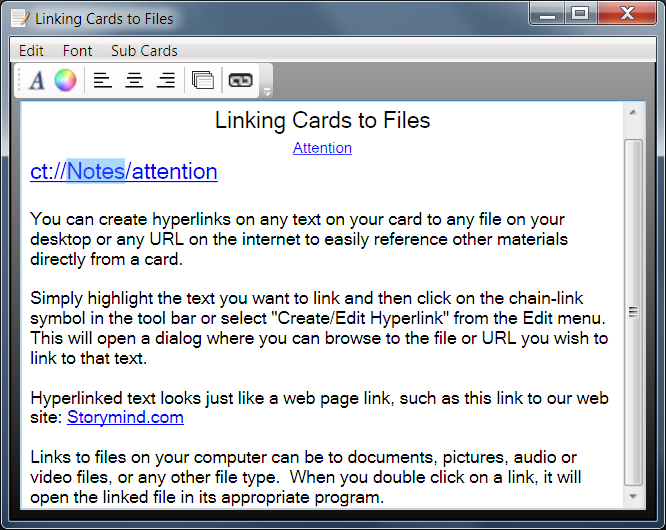 But you can also create "Sub Cards," or cards "within any card, just like having files within folders. So, for example, you could have a card for every character in a story and each character could have multiple sub-cards for their traits, physical attributes, even for their character arc. 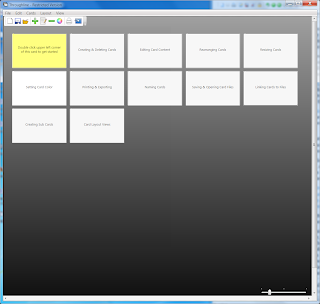 Sub-cards can have their own sub-cards, so you can go as deeply into detail as you like." I like what I see and I will experiment with the program a little more, but I am pretty sure I will buy it. 1. There is also a version for "Macintosh OSX version 10.2 or better." It seems to be available on CD only. It seems to work in the same way as the Windows version, but I have not tried it. Price: 19.95. 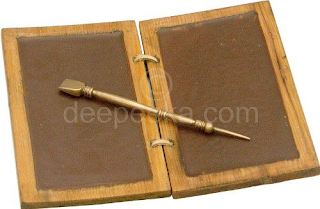 A Roman Writing Tablet available at Amazon for around $67.00. I wish I could afford one, but first I have to pay some more taxes ... and even then it's a bit steep for something I will probably never use. I do like the format for note-taking, however. What you see is a diptych, formed of two pieces of wood. For heavy note-takers there were triptychs (made of three pieces) and others with even more pieces.